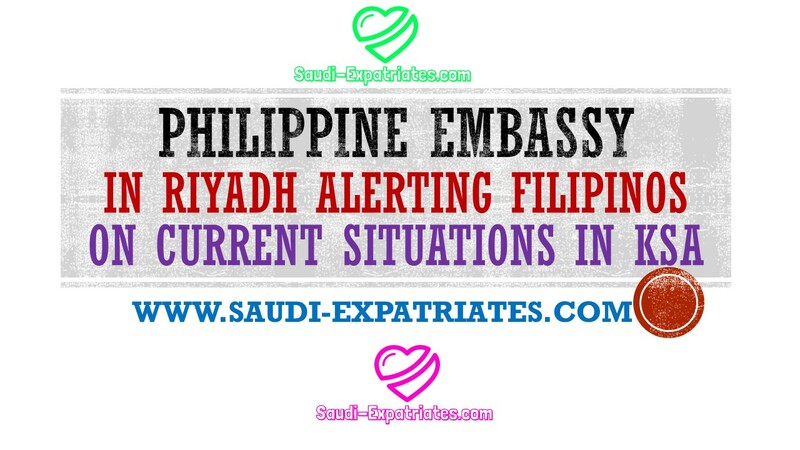 Last week Philippine Embassy in Riyadh issued an advisory notification to all the Filipinos living in Saudi Arabia about the current situation in kingdom amid reports of imminent war. The Philippine Embassy in Riyadh asking all Filipinos living in Saudi Arabia and Yemen to register with Embassy through its website by entering Name, Occupation, Birth Date, Address in Saudi Arabia or Yemen, Passport Number, Passport Issue Date and Expiry Date, Region and City, Contact Details including Phone and Email, Employer Name, Contact Number, Relative Name, Email and Mobile Number in Philippines. It is important for all Filipinos to register as the embassy will contact you regarding important updates, services and advisories on important matters to filipinos in Saudi Arabia. For registering follow this link "Registration for Filipinos living in KSA".